Focusing primarily on electric vehicles and alternative energy, Tesla and founder/CEO Elon Musk have become synonymous with the advancement of technology in the automotive industry. But still, many observers have been wondering for years why this dynamic company has yet to take the plunge into another form of automotive technology: autonomous vehicles. Well, it appears that these pundits may now be silenced. According to Automotive News, Tesla is preparing to toss its hat in the autonomous ring. “Tesla Motors Inc. will make its first foray toward automated driving, joining luxury rivals in offering high-tech features, including one that can keep the car in its lane,” proclaimed the article. According to Automotive News’ inside tip, the new autonomy plans for Tesla include adding electronic features that will help drive the car and keep the car in the lane as it navigates through congested traffic. 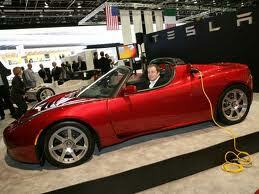 Obviously, this is a major and necessary move for Tesla, the new American automotive darling. Currently, every company from GM to Nissan to Toyota has showcased their plans and even gotten certain semi-autonomous cars on the road. Of course, this race for autonomy is only just starting to heat up. Experts have projected that over 90% of vehicles on the road will be autonomous by 2050. For Tesla, such a technologically advanced company, this change of landscape may be their best opportunity to move up into the upper echelons of the automotive industry. This entry was posted in Culture, Tesla and tagged autonomous, cars, Elon Musk, GM, Nissan, tesla, Toyota, unveil. Bookmark the permalink.